The Perth Mint recently introduced a brand-new series of half-ounce silver coins celebrating the younger members of the feline world. 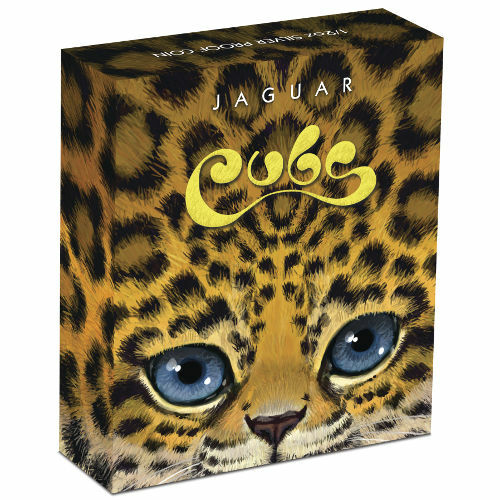 The Australian Cub Series celebrates the members of feline kingdom in the wild, but focuses on the cuteness of cubs. 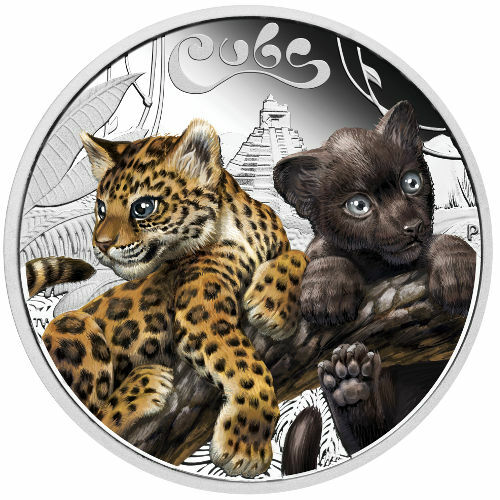 Right now, the 2016 ½ oz Silver Australian Cub Series Jaguar Cub is available for purchase on Silver.com. Limited mintage of just 5,000 coins available for this design! Second release of the Silver Australian Cub Series! Arrives in a themed presentation package, and includes a Certificate of Authenticity. Bears a face value of $.50 with legal tender status in Tuvalu. Reverse features two adorable Jaguar Cubs. Struck as a proof specimen. Jaguars are not native to the Australian continent, or anywhere else in the region. Native to the Americas, the jaguar is the third largest cat species in the world and the largest in the Western Hemisphere. When a jaguar cub is born, its eyes remain shut for two weeks. Associated with thick rainforests, rivers, and swamps, a jaguar cub is taught to stealthily hunt its prey from the age of six months. The jaguar cub will leave its mother’s den by the age of two to fend for themselves. 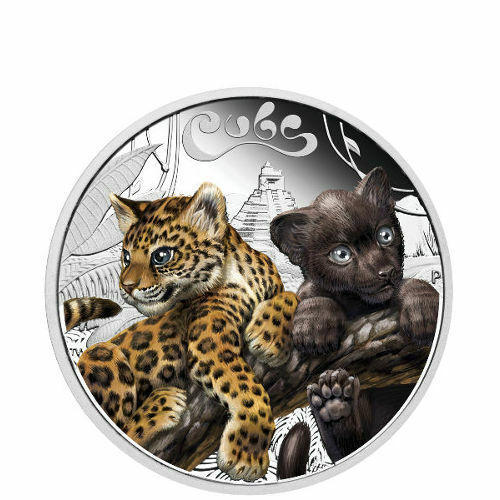 All 2016 ½ oz Silver Australian Cub Series Jaguar Cub Proof Coins are available inside a black display case from the Perth Mint, and ships inside of a colorized box celebrating the Jaguar Cub in the series. 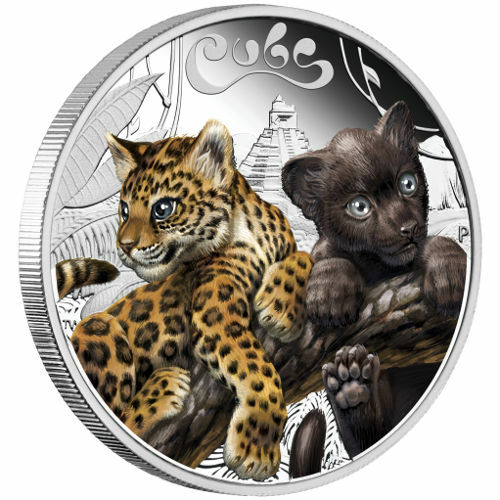 The second of five coins, the Jaguar Cub was preceded by the Tiger Cub coin, and will be followed by the release of the Leopard Cub, White Lion Cub, and Lynx Cub coins. On the obverse is the right-profile portrait of Queen Elizabeth II, England’s longest-serving monarch. Her image has appeared on British and commonwealth coinage since she ascended to the throne in 1952. The reverse features two young jaguar cubs with different coat patterns found in the wild. One cub has the familiar yellow-and-black spots, while another is a sleek, jet black in appearance. An Incan temple in the background serves as a nod to the Americas, and the word “Cubs” is engraved above. If you have questions, please feel free to contact Silver.com. Our associates are available at 888-989-7223, online using our live chat, and via email. 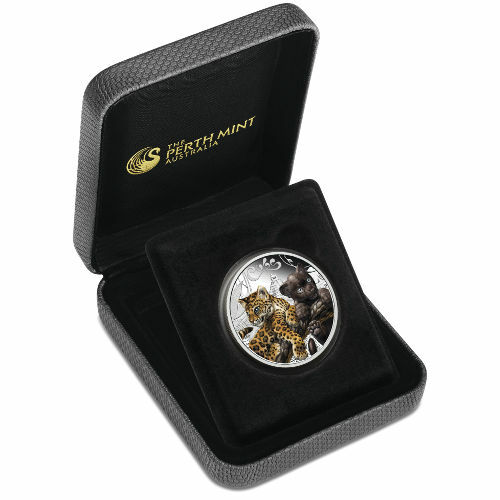 To browse similar products, check out our full selection of Silver Perth Mint Coins.